Disappointments come in all sizes – from a single drop of rain on a silk blouse to catastrophic flooding. 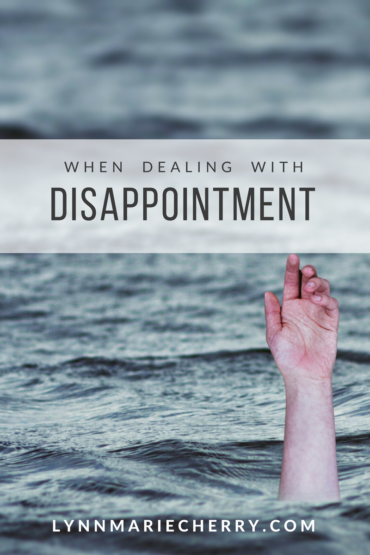 Historically, I’ve dealt with disappointment by choosing denial – telling myself, ‘It’s not a big deal, I’m fine.” In reality, I was exhausted from treading water for eight years and felt like I was drowning everyday. It’s good to have a positive outlook, but don’t mistake denial for positivity. So how do we deal with disappointment? The very first step is to own it. Own what happened and how it made you feel. Acknowledge the pain and losses, because you cannot heal what is hidden. I believe Jesus felt utterly forsaken, alone, and abandoned. He felt it because we feel it. There is nothing we face in life that Jesus didn’t experience during his time on earth. However, I don’t believe God the Father deserted his Son on the cross. God told the children of Israel, “I will never leave you nor forsake you.” How could he then abandon his own Son? How could God separate himself from himself? Own it and then remind yourself that God is with you in the struggle. He will never leave nor never forsake you. Another important step is to keep your hope in God. The disappointments in our lives come when we place our hope and expectation on the shoulders of other human beings. Humans change their minds. They make promises they can’t keep. They lie to avoid consequences. It’s a factor of our fallen humanity. God needed us to know that he is not like everyone else we experience on this earth. He doesn’t lie or change his mind. He keeps his costly promises. You can trust in, lean on and depend on him! Let your hope and expectation rest on God’s strong shoulders. Times of disappointment bring with them some of life’s greatest opportunities for growth. The maturity part sounded good. I just wanted to get there without the trials and troubles. Thank you very much. Imagine a life where you are mature, complete, well-developed not lacking or deficient in any way. That’s a pretty great life. There is a grounding wisdom that comes when you experience God’s love, grace and faithfulness in the middle of your disappointment. No one can take that away from you. The things I’ve learned difficult seasons have given me great confidence. They make me brave. Because I figure, if I can make it through that…I can make it through anything. We all face disappointment. We can choose denial. We can stay stuck in the sorrow of misplaced expectations or we can do the hard work of owning it, keeping our hope in God and allowing endurance to bring maturity and growth. Disappointment always presents us with an opportunity. Whether or not we allow transformation is our choice.